Based in Burlington, Ontario, we at The Material Handler design and install effective commercial and industrial warehouse racking systems and innovative warehousing solutions to our customers in Burlington, Mississauga, and the greater Toronto area. 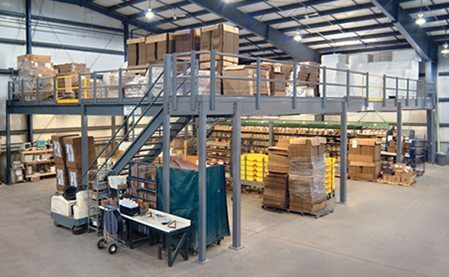 Starting with warehouse basics such as pallet racking, mezzanines, modular offices, and shelving, extending to ergonomic material handling processes like lift tables and conveyor systems, our goal is to analyze your warehousing situation and work with you to maximize the total usage of cubic square footage and to create an infrastructure for organization and efficient work flow. Warehouses and storage units are all quite different from one another. We understand that they all have different floor plans, ceiling heights, and so on. If you are interested in using your space wisely and improving your return on investment, a visit from one of our representatives might be a good idea for your business. 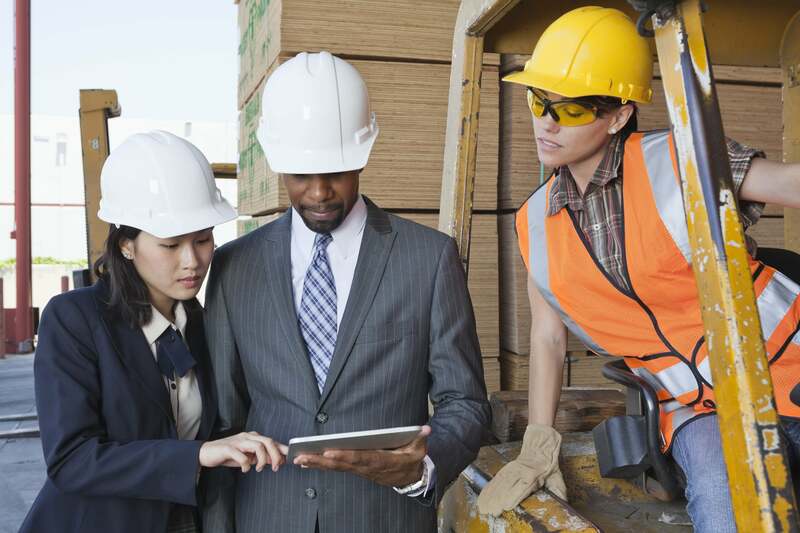 Our skilled engineers can amalgamate our different services to come up with a unique layout for your building using the following services to make your workplace safer and more efficient. 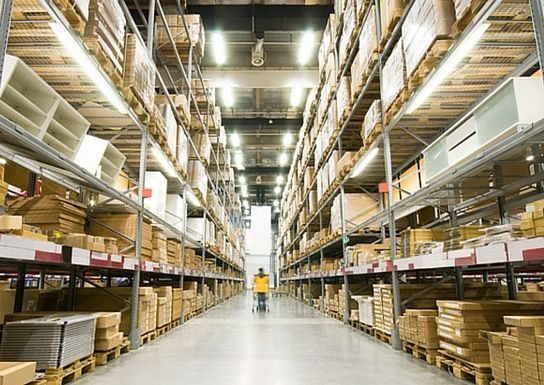 Whether you’re planning a new warehouse or modifying your existing location, let us help explore all options to optimize total cubic space while also creating an efficient flow of material in and out of your facility. 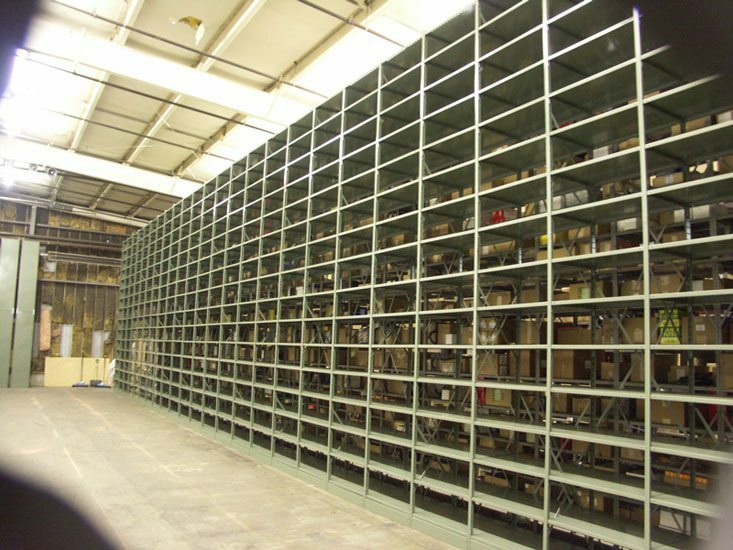 There are many different types of pallet racking systems, and we have a wide array of options. All of them are built to hold pallets in rows which can then be loaded vertically to have several levels. We offer Single Selective, Double Deep, Pushback, Drive-In, Pallet Flow, Carton Flow, Very Narrow, and Aisle Cantilever. 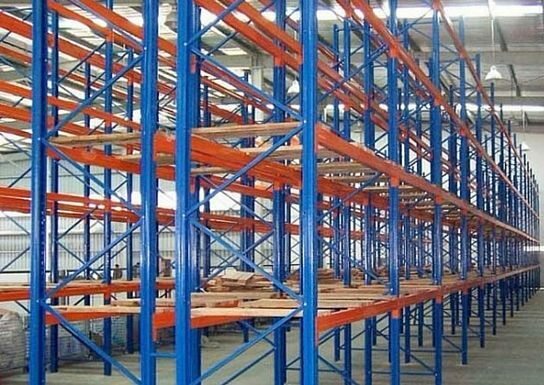 If you would like to learn more about these pallet racking systems in finer detail, please visit Pallet Racking 101 on our blog. Pallet wrappers are essential to any well organized, efficient warehouse workspace. 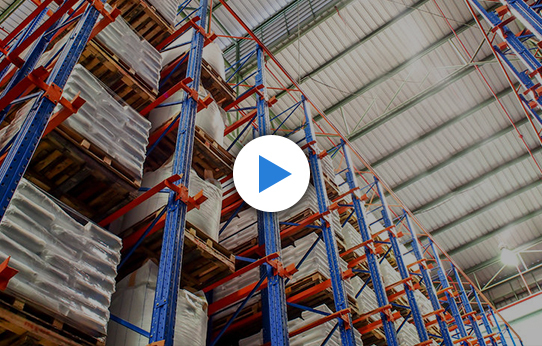 In addition to implementing a warehouse management system (WMS,) and increasing efficiency with racking systems, pallet wrappers are the best way to keep your products safe, dry, and organized. Without pallet wrappers, pallets are subject to wear and tear, and may even shift and topple, causing damage to your product. By installing a platform above space that can continue to be used for storage or the flow of material, our mezzanine system creates vertical practical space quickly and easily where there was none before. When mounting a mezzanine, an engineer is sent to establish the dimensions for a perfectly fitting system. AutoCAD files are drawn up and tweaked until they are approved. After choosing many different options for decks, rails, gates, and staircases, the mezzanine can be quickly installed. 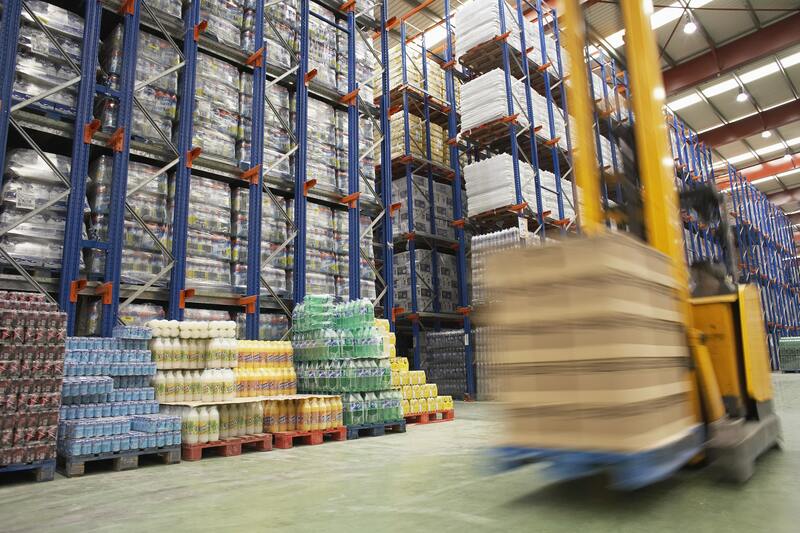 In most cases, warehouses don’t even have any down time. 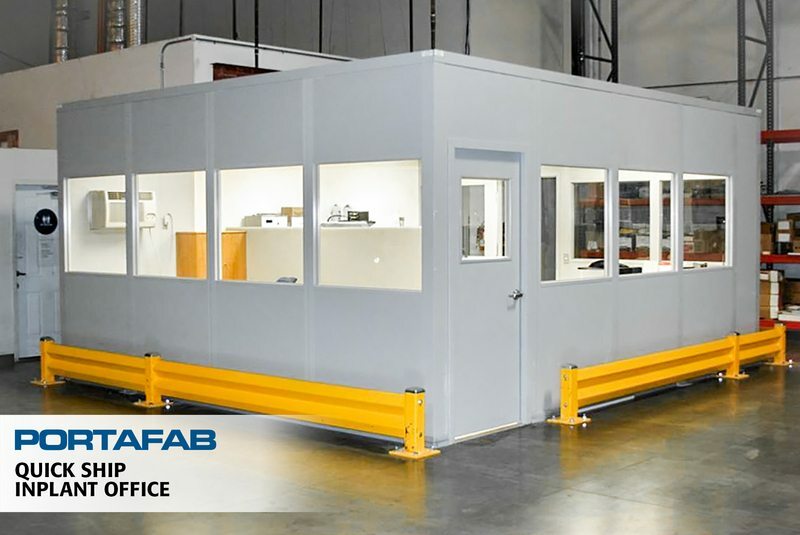 If you are looking for a quality in-plant modular and portable office or cleanroom with wall partitions that can be installed quickly and efficiently, The Material Handler has an array of options for you. In-plant offices are a requirement when the workplace becomes loud and distracting, and we have many solutions to help counter the actualities of warehousing. 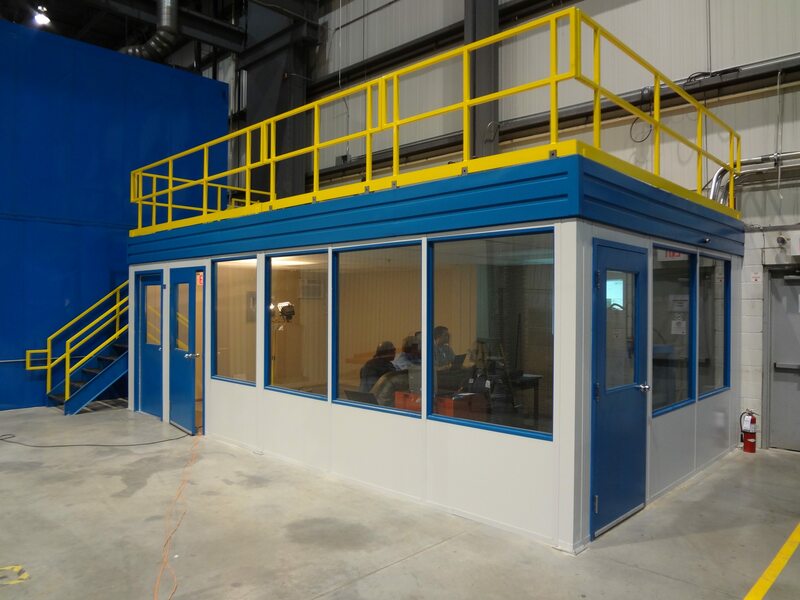 Whether it is to have team meetings, interviews, control operations, or simply have lunch or make a phone call, a modular office offers a clean, quiet office or cleanroom to get away from the seemingly unavoidable dust and commotion. We comprehend the unpredictability that businesses face today and we can guarantee that one of our products will satisfy your needs. When working in a warehouse, the movement of products often presents complicated circumstances where workers must do the heavy lifting instead of forklifts. 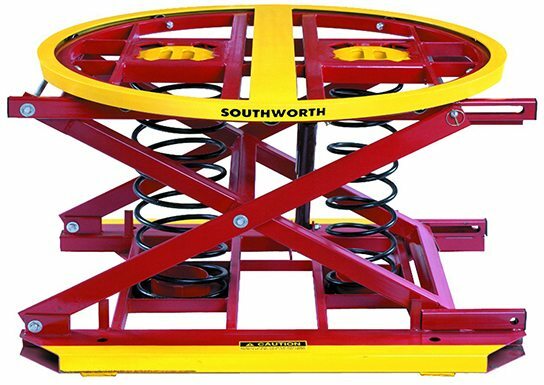 This is where we can supply you with a lift table, pallet positioner, container tilter, stacker, or loading dock lift from Southworth Products to make the job faster, safer and easier. Each of these has an individual purpose – to reposition objects for workers to let them maintain a good posture regardless of their physical ability. 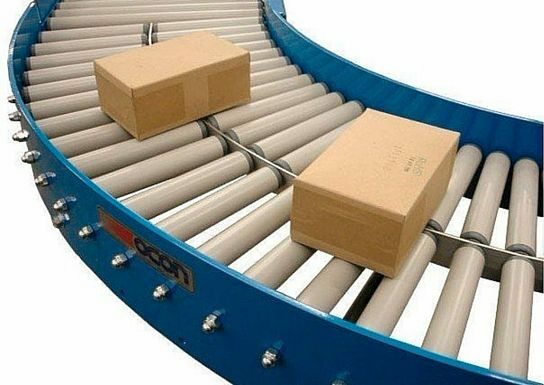 A conveyor system is a piece of mechanical ergonomic handling equipment that facilitates the flow of equipment by automatically transporting them from one part of the warehouse to another. Your materials can be transported by one of our many parts which can be found on our product page and can be encompassed in a grander application. 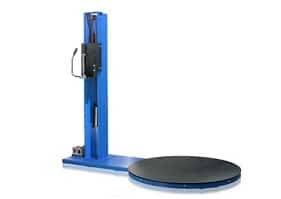 Whether it be for simply transporting, or for accumulation, singulation, sortation, palletizing, robot systems, or pallet sortation, we can supply you with a solution to the movement of your heavy and bulky materials. If you run a warehouse, perhaps you need a shelving unit to store boxes, cartons, bins or totes which can be accessed quickly and easily, multiple times a day. At The Material Handler, our engineers know how to design a seamless shelving system with an entirely customized layout for your warehouse in order to improve item selectivity while accomplishing better storage optimization and allowing room for forklifts to make their way down aisles. Our products are strong, economical, and efficient. Our Shelving materials which can be assembled with a ton of different of options when choosing shelves, drawers and dividers. If you are located in the Burlington, Mississauga, or greater Toronto area, we are ready to answer your phone call and answer any questions regarding our services. Feel free to email your queries or speak to a representative. Get all of our contact information here. Our groups of Material Handling Specialists are passionate about creating effective warehouse and storage solutions. By offering a consultative based approach to getting to know our customers material handling processes we are able to implement industry leading concepts and designs.